John Goodricke was a brilliant astronomer from the era of the amateur scientist. Deaf from early childhood, he was already being recognised for his work before his life was cut short, writes Linda French. The name of John Goodricke is recognised today only by astronomers. Few details of his life and work are widely known beyond the facts that he was profoundly deaf and that he died at the age of 21. Together with his mentor Edward Pigott, Goodricke discovered and measured the variation of light from stars that would, in the 20th Century, enable astronomers to determine distances to distant galaxies. They also measured the changing light of stars such as Algol, and speculated that the regular dimming of Algol's light might have been caused by eclipses due to a "dark body," perhaps even a planet. For his part in this work, the Royal Society of London awarded Goodricke the Copley Medal, its highest honour, at the age of 19. He remains the youngest recipient of the award. Goodricke was born in Groningen in the Netherlands on 17 September 1764. His father was a diplomat. His grandfather, the baronet Sir John Goodricke, was Envoy Extraordinary to Sweden, an MP and a member of the King's privy council. As the eldest surviving male of his generation, the young astronomer would have been the heir to the baronetcy had he lived a full lifespan. Goodricke became deaf in early childhood due to a severe illness thought to be scarlet fever. At the age of seven he went to study at Thomas Braidwood's Academy for the Deaf and Dumb in Edinburgh, the first school for deaf children in the British Isles. Braidwood's success attracted pupils from as far as the Americas, and parents paid substantial tuition for his services. Samuel Johnson, visiting Braidwood's academy during Goodricke's time there, found the accomplishments of the pupils impressive. "It was pleasing to see one of the most desperate of human calamities capable of so much help," he wrote. Goodricke went on to study at the Warrington Academy, one of the academies run by religious dissenters, for three years after leaving Braidwood's. The school was well known for its emphasis upon mathematics and natural philosophy (science). A school report describes Goodricke as "a very tolerable classic and an excellent mathematician". Goodricke's notebooks from Warrington show that he was already observing the sky at the age of 15. In 1781 Goodricke completed the three-year course of study at Warrington and returned to York. He began a journal recording his observations of the sky as well as his conversations with his neighbour Edward Pigott. 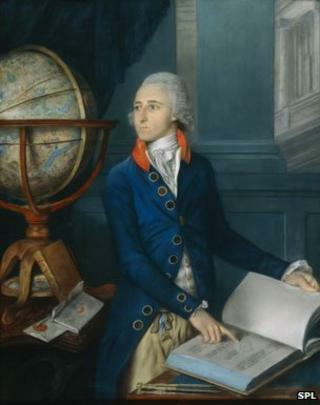 Pigott had learned to use astronomical observations for determining latitude and longitude from his father Nathaniel, also an astronomer. Goodricke and Pigott observed every clear night. Most of Goodricke's observations were made from the family's lodgings at Treasurer's House (today managed by the National Trust). In the autumn of 1782 they decided to study stars whose light appeared to vary with time. On 12 November, Goodricke noted: "This night I looked at Beta Persei [Algol], and was much amazed to find its brightness altered... I observed it diligently for about an hour - I hardly believed that it changed its brightness because I never heard of any star varying so quickly in its brightness." The two determined that the dimming of Algol's light occurred exactly every 2.767 days and speculated that an unseen planet was eclipsing the star. Goodricke's report was read to the Royal Society in early 1783, and in August he was awarded the Copley Medal. In the brief time remaining to him, Goodricke determined the time of variation of two more important stars. Soon after his election to the Royal Society in 1786, Goodricke was dead. It has been suggested that exposure to the night air hastened his demise, but no medical records have been found. Pigott wrote: "This worthy young man exists no more; he is not only regretted by many friends, but will prove a loss to astronomy, as the discoveries he so rapidly made sufficiently evince: also his quickness in the study of mathematics was well known to several persons eminent in that line." The biographer Richard Holmes cautions about the shroud of myths that often envelops scientists of great accomplishment. The primary myth is that of the lone, heroic figure, struggling against misconceptions perpetrated by lesser minds, against his (or her) own family, and perhaps even against society itself. Knowing that deaf people suffered prejudice and inhumane treatment in Goodricke's time, some have assumed that he worked alone. Goodricke's education and his collaboration with Pigott are overlooked, as are his communications with William Herschel, the discoverer of Uranus, and Nevil Maskelyne, then Astronomer Royal. He is often described as "deaf and dumb," or a "deaf-mute". Stories in his journals about conversations with tradesmen, however, indicate that he read lips and almost certainly spoke. The 20th Century astronomer Zdenek Kopal furthered the myth of the isolated genius when describing a visit to the churchyard of St John the Baptist at Hunsingore, the burial place of the Goodricke family. Kopal was dismayed not to find a burial stone with John Goodricke's name on it. He wrote: "Why does he rest there forgotten by all his clan; why was he not buried with them in their family vault?" He went on to speculate that Goodricke's family found his deafness to be "a blot on the family escutcheon". But Kopal did not investigate the history of the present church. It was constructed in 1868, decades after the Goodricke family estate at Ribston had passed into other hands. The Goodricke family vault still exists, as do the burial records. They show that Goodricke was indeed buried alongside his parents and grandparents in the vault. Goodricke had the advantage of a caring family who could provide the education he needed. His seminal work in stellar astronomy proves that special education for those with disabilities can bring benefits to all.